Love travelling to 5-star hotels? why not travel to a 7-star hotel in a 5-star country? There’s so much to see in Dubai from world-famous restaurants to buzzing nightlife. The Dubai Travel Guide will give you a moment of Luxury, sunshine and the wow factor. The Dubai Mall is bigger than 50 football pitches and is a full attraction its self. 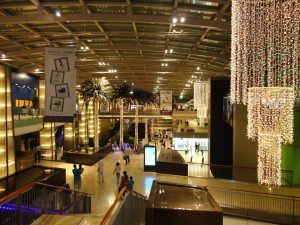 I normally don’t recommend shopping malls in my travel guides as shopping mall are normally the first place tourist like to head towards. Dubai Mall is more than your average shopping mall it hosts 1,200 shops ranging from designer shops to souk village style clothing. Aside from this all there is an aquarium, Ice-skating ring, and Cinema. Grab yourself lunch at the fountain side restaurant or next to the magical waterfall. The entrance to Burj Khalifa is with the Dubai Mall. If you head to ” At the top” in the Dubai Mall you can Enter the tallest building in the worlds. Burj Khalifa spikes Dubai’s skyline at 555 meters. you can take in the view at the 125th or 148th floor giving you a new perspective of Dubai. 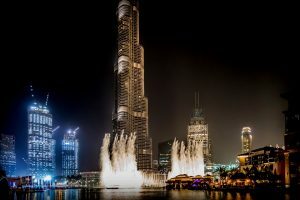 Why not travel up Burj Khalifa at night to see the magical city come alive?. The Dubai Fountain show runs every 30 minutes and is the most dazzling display you will experience. Once the show comes to an end why not cross the bridge and enter Souk Al Bahar, an Arabian style resort housing shops, bars, and Restaurants. You won’t be able to have a pint of beer or a glass of wine at the restaurants inside the Mall but at the eateries, in Souk Al Bahar you’ll be able to grab yourself an alcoholic beverage. Some of the restaurants do have their own private balconies and can be enjoyed during Dubai’s breathtaking temperatures if visited during the summer. 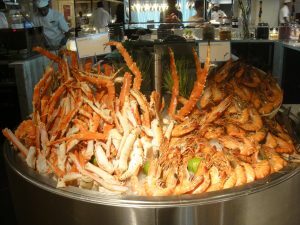 The restaurants range from Asian cuisine to Meat feast depending on your appetite. Delve in Dubai’s past by visiting Bastakiya, which is also known as Al Fahidi the historical neighbourhood. you can join a walking tour or simply stroll the charming street. if you pay 1 dirham you can enjoy a ride across the creek on a traditional abra. 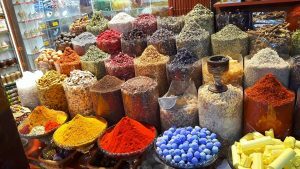 on the other side of the creek, you can explore the aromatic atmosphere of the spice, tea and gold souk. The creek is the place to visit even if it’s just to browse and not buy anything. 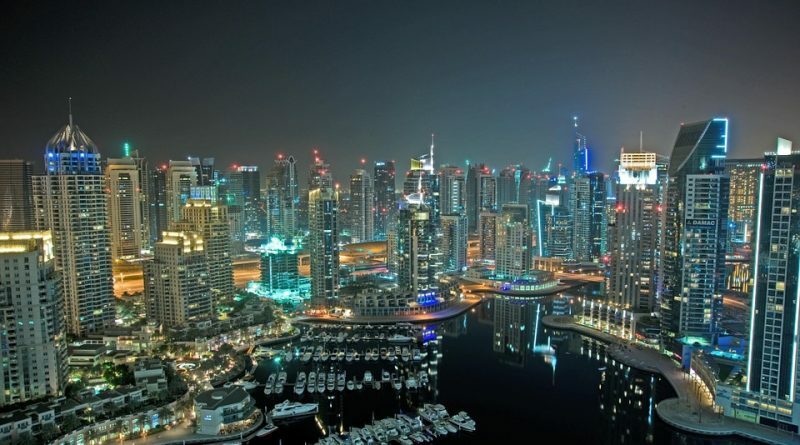 it is one of the few areas in Dubai that has retained its character as many other areas have been overtaken by the many skyscrapers being built. 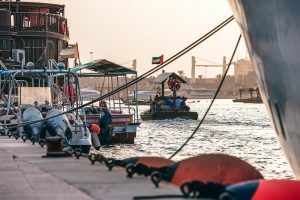 Old Dubai shows you that there is real culture to be found in Dubai as the sun sets you can enjoy a dinner cruise on one of the many wooden boats docked at the creek. Your visit to Dubai would not be complete without a visit to the desert. There are a number of tour companies that can guide you on your visit to the sand dunes, or you can explore unaided by highering a vehicle. 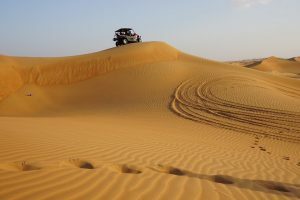 many of the tour companies offer various desert adventures such as 4 x 4 dune- bashing experiences to dinner after dark at the Boudin camp, along with belly dancing shows and a chance to see how desert people used to hunt for food. There’s only one meaning to the residents of Dubai on a Friday and that’s brunch. Join the expat crowds at one of Dubai’s feasts. these feasts take place in every well-known eatery serving lots of delectable foods and bottomless booze with that party vibe. the brush can be tailored to all types of tastes ranging from the family-friendly atmosphere to high blow affairs there enough to cater for all needs even if you’re just in it for the free-flowing bubbles. Bunch starts at 12 pm and normally ends at 4 pm in time to head to bed trust me you’ll want to sleep early after all that food !!! 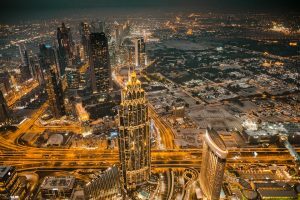 Has the Dubai travel guide Tempted you to travel to the 5star country? Know someone traveling to Dubai? please do share the Dubai Travel Guide with friends and family. Feel free to leave your thoughts and comments below. Copyright © 2019 Travel Guides to Destinations Around the World – Travel Stuck. All rights reserved.